Army Day observed by organizing various programmes - Integration Through Media ....! KATHMANDU: President Bidya Devi Bhandari attended a special programme organised at the Army Pavilion, Tundikhel, organised on the occasion of Nepal Army Day and Shivaratri this evening. 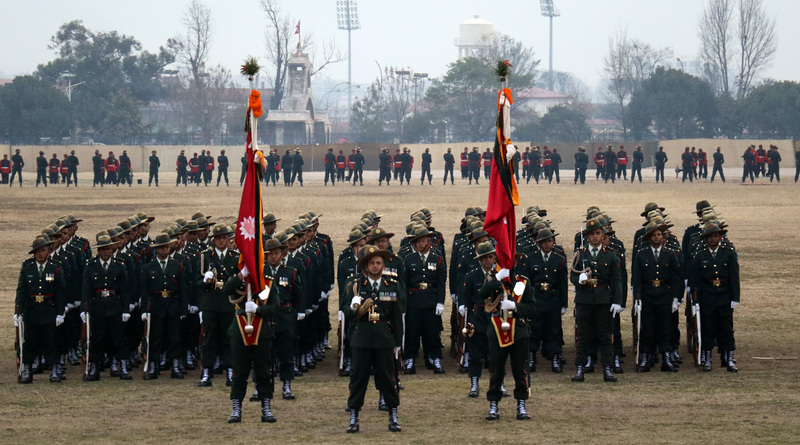 President Bhandari is the Supreme Commander of the Nepal Army, Bhandari participated as the chief guest in the function where Nepal Army presented a variety of programmes including march-past, parade, cannon and gun salute and free-fall. Vice-President Nanda Bahadur Pun, Prime Minister Sher Bahadur Deuba, Chief Justice Gopal Parajuli, ministers, Chief of Army Staff Rajendra Chhetri, high-ranking official of the government and high-ranking army officers were present on the occasion. Similarly, Chief of Army Staff of India, Bipin Rawat, who arrived here to mark the 250th anniversary of the unification of Nepal, also participated as a special guest at the function. Rawat is honorary General of the NA.